1. Hydration: Drinking water throughout the day is one of the best steps you can take to keep your skin looking and feeling healthy. Grab a reusable water bottle to keep with you while you’re at work, on the go in the car, or while you’re at the gym. It is recommended women drink 11.5 cups of water per day and men drink 15.5 cups of water per day. Staying hydrated is important especially if you are traveling by air. Keep in mind that if your activity level is high or you are in hot/humid weather, those needs might change. Avoid caffeine, alcohol, and soda. 2. Sunscreen: The American Academy of Dermatology recommends wearing sunscreen that has at least an SPF of 30 or higher, broad-spectrum protection (protects against UVA and UVB rays) and is water resistant. Sunscreen is a must for those trips to the beach but it should be a part of your everyday skincare routine. Remember, however, that seeking shade is still best. Don’t forget to pack a wide-brimmed hat and sunglasses. 3. Cleanse and moisturize: Using a daily cleanser and moisturizer with SPF appropriate for your skin type is essential to maintaining skin health and balance. When you travel, your skin can be thrown off by environmental factors. 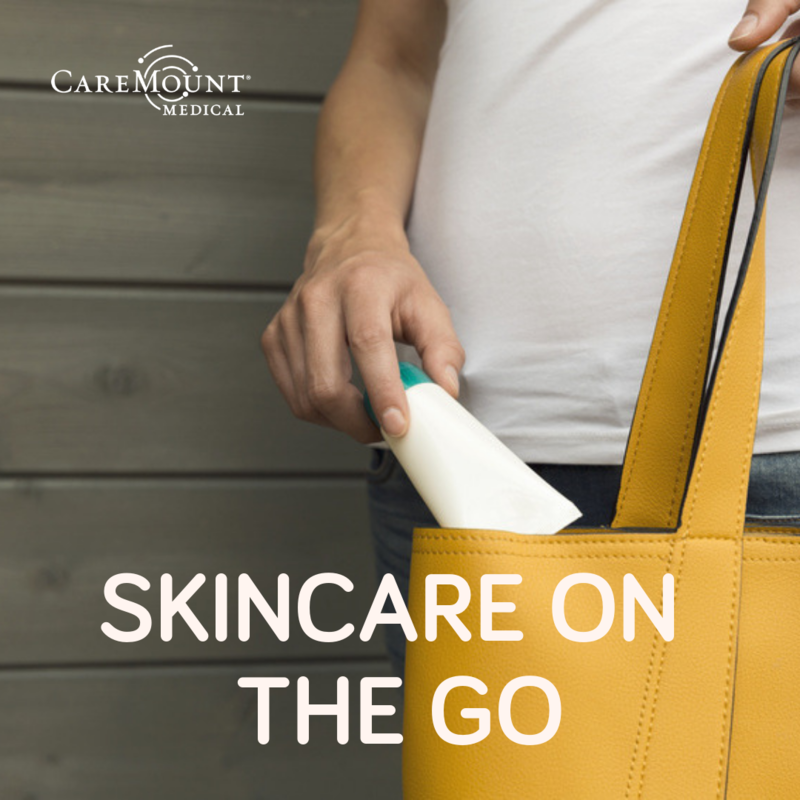 Travel size bottles make it easy to carry your favorite cleanser and moisturizer when you’re traveling for work or pleasure. Don’t forget to moisturize your hands as well as your face and bring a good hand moisturizer. 4. Face wipes: Pre-moistened cleansing pads are great when you’re traveling as they help to easily remove makeup. Be sure to use your cleanser after removing your makeup with a cleansing pad or wipe and try to wear minimal makeup/foundation while traveling as it can clog pores. A tinted moisturizer with SPF is a good alternative. 5. Lip treatment: Your lips can get dry while traveling especially at higher altitudes. Pack an SPF containing lip balm and apply it liberally. 6. Sleep: Getting the appropriate amount of rest is so important for our bodies including our skin. Try to get 7-9 hours of sleep a night.